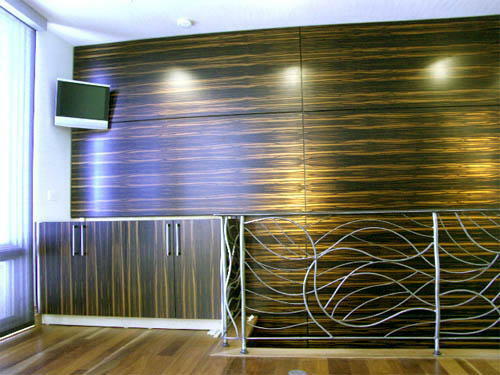 Wood River Veneers Project/Portfolio page is meant to display some of the many residental and commercial projects we have been involoved in over the years. We provide doors, cabinetry, fixtures, beam facades, sequenced wall, ceiling and cut to size panels, furniture and components, tables, tops and many other home and office decor applications. Between all of us we have so many years of experience it scares me when I add it all up because I just end up feeling really old. There are too many projects to put on this website at one time so we rotate them in and out of the site just to keep things interesting. If you are looking for something in particular and you are not finding it on our site, we invite you to call us on our toll free number for more information. 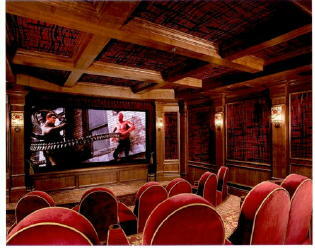 Wouldn't it be nice to have a home theater? I think everyone should have one of these in their home. We fabricated sequenced Claro Walnut panels for wainscoat, pilasters and several other applications in this theater. 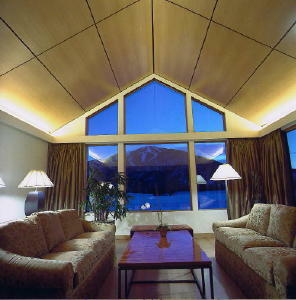 The millwork is also Claro and the acoustic panels are covered with fabric. The finish is clear with no stain, so you are actually looking at the natural tone of the wood. WOW! A wood that actually doesn't need to be stained! I really like Etimoe, especially when it is quarter figured and leans more to the brown side with black grain running through it. This home is perfect for Etimoe. The house is contemporary in style and has lots of light. The wood is dark and really stands out with natural light and white tones of paint. We have used Etimoe in darker settings as well and it looks just as nice. It's really hard to find Etimoe lumber so we usually use Peruvian Walnut when we need dimensional lumber to accompany the veneer. A lot of the Etimoe that we see isn't all that great so we have a tendency to look far and wide before we find a flitch we like. That doesn't mean that our customer is looking for the same thing so we work with what they like. This wet bar is located just to the rear of a large ground floor entertainment room. It also just happens to be the access to the homes mechanical room and a pretty large storage area, hence the pair of doors in the back wall. The potential for this particular spot to be dark was what lead the owner to decide to use the lighter toned Beech, and the Amarillo, which is a medium tone, in order to perk the area up a little. The flooring is Beech and the cabinets we fabricated that are placed around it, also have Beech incorporated into their construction. 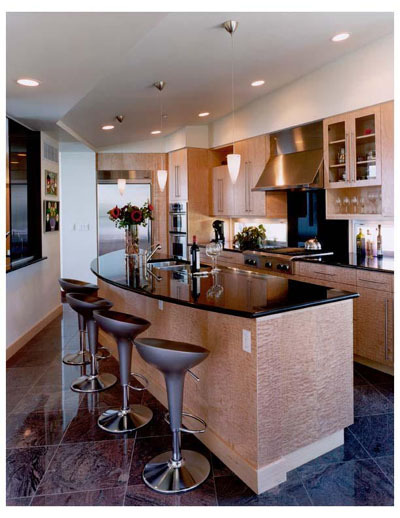 The emphasis for this entire area, since the only natural light it has is coming from one daylight wall, was to keep most of the furnishings and cabinetry light to medium tones. We did a lot of work in this house and it really is attractive. The owner designed everything and did a tremendous job. We were very fortunate to have the opportunity to work on this project. This is a mountain home we worked on for more than a year. During that time we cut to size, center balanced and sequence matched many quarter figured Cherry panels for wall applications and cabinetry. This moderately sized home consumed approximately 40,000 square feet of figured Cherry, not to mention the 30,000 square feet of figured Maple, Sycamore and Pecan that went into it as well. 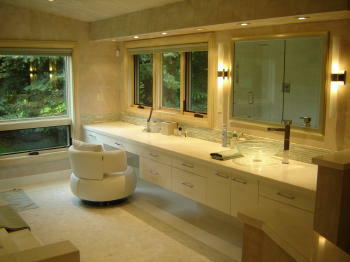 It is a home with no exposed sheet rock, just cabinet quality architectural veneer everywhere. This home is stunning. From the moment you set foot on the property it is one large cabinet inside and out. I just do not know how else to describe it. 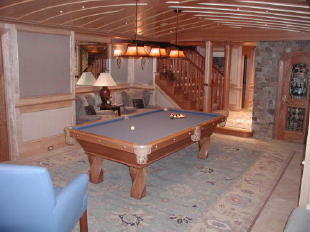 I was very pleased that Wood River Veneer was asked to participate in the construction of this home. 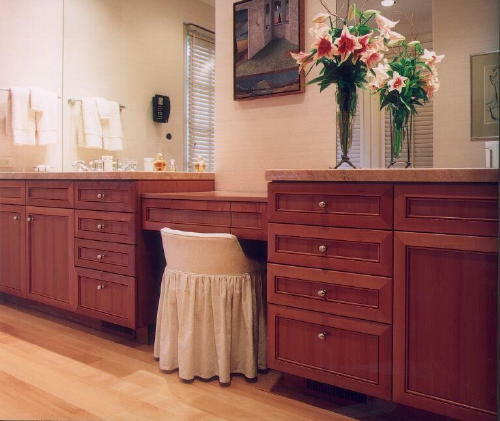 We built these Master Vanity Cabinets with European Pearwood and the entire master suite is Pearwood. If you look closely at the pictures, you will see that the style and rails actually taper to the outside of the doors and drawers. We then incorporated a bead that stands proud of the style and rail as well as the panel. This was a very hard detail to apply because it couldn't be cut with a cope and pattern set. We had to apply this detail during the assembly process. 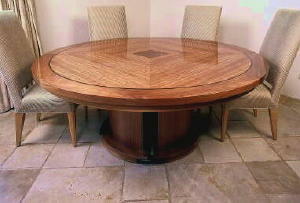 We were able to find some very plain Pearwood for this project, which can be a difficult thing to do at times. The lid of the make-up station does lift up and has its own mirror as well as a drawer. These cabinets were a lot of fun to build. For this project we were asked to produce book, balance and sequence matched quarter flake white Oak cabinet doors, drawer fronts, interior doors and various end and other panels. We used a very large sequence that had both wish bone and tiger flake. We split the sequence into two parts using the wishbone portion to build the interior door pack while the tiger stripe portion was dedicated to the cabinet component parts. The flitch color was a nice honey tone and very consistant. The final finish color was a medium honey brown with a satin lacquer. 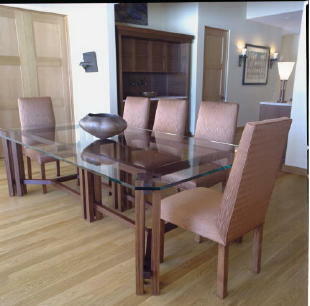 These are two variations out of several dining tables that we have built over the years with a similar type of base construction. In each case we used an open strut base construction with either a solid or glass top. The designer of these tables prefers these three woods as well as domestic Walnut, Sapele, Mahogany, Makore, Pearwood, Rift white Oak and Beech. We do not like exposed fasteners so we hide as much as possible. In the case of these tables nothing is exposed. The tops do separate from the base for moving, storage and possible repair purposes. 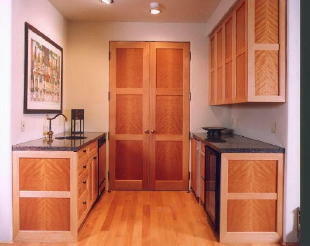 These European style cabinets required cut to size book matched, center balanced and sequenced Figured Anigre panels. We used a medium figured Anigre on the face and a plain quartered Anigre on the back side of anything that was good two side. 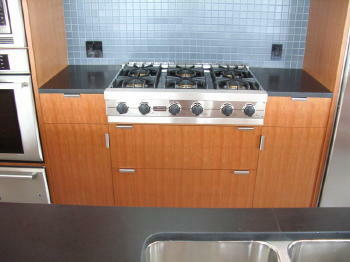 This kitchen received a natural satin lacquer finish. This cabinet appears as if it is a free standing piece of furniture when in reality it is built in. It doubles as a wet bar and buffet. We were asked to provide the component parts for this piece for another shop so we did. Both the veneer and the solid Afrormosia is quarter cut. 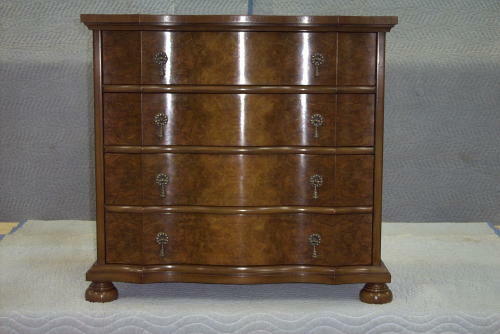 The cabinet was finished with a medium brown glaze and several coats of satin lacquer. 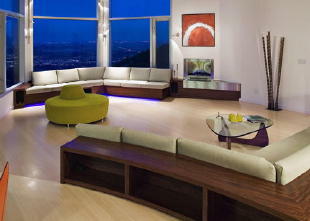 This is a home that we recently furnished cut to size, balance and sequenced, slip matched rift Cherry panels. We incorporated solid edges on these panels and cut them to 1/64" over finish size. The designer and owner decided they wanted a slip match because the finish tone was very important to them. We did provide samples of both book and slip matched rift Cherry for them to pick from. All the veneer came from one sequence that we clipped the rift quarters from. The back side of the panels are quarter cut, just not as nice a rift grain. 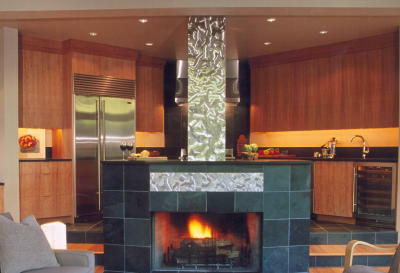 This home is in the mountians of Idaho and it has a modern open design. 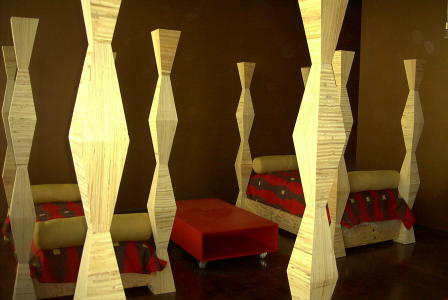 The owners were very willing to incorporate some untraditional woods in to their interior finish. 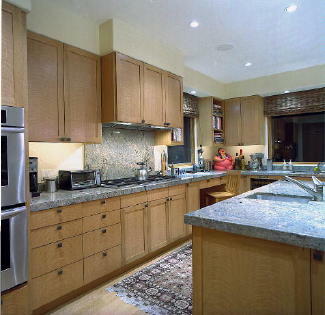 The kitchen cabinets and master bedroom are plain and quarter cut Madrone veneer. The staircase and wood flooring is pommele and plain Makore. I like the contrast between these woods and the more traditional cedar and fir that were used. I would like to see more of this happen rather than the standard fair of reclaimed Fir, Alder and Pine to the point of over kill. Keep in mind, just because our fore fathers lived in log cabins and some pretty rustic conditions, doesn't mean they wanted to. Big knot holes filled with putty doesn't do anything for me. This is a nice size kitchen, not to big or to small. It has clean lines and fits the space its in well and that, I think, is what makes it work so well with Quilted Maple. One thing I have noticed over the years is that you need to be careful with quilted Maple. It has such a spectacular appearance that the tendency is to go a little over board and before you know it,"over kill"! Incorporating other woods, especially quarter cut and plain sliced Maple in with it helps the quilted stand out but not take over. I put the pictures of this desk in for an example. We built this desk with a quarter cut Maple base and used plain sliced Maple for the border with a field of quilted Maple. Even though building the desk was anything but simple, it looks clean and the quilted really stands out. 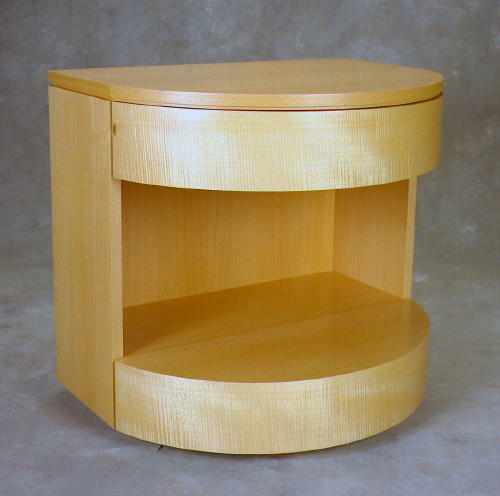 We have produced several pairs of these radius nightstands in maple and Pearwood. They are very attractive but labor intensive to construct. When we build these, we pay great attention to detail and matching. These cabinets are not mass produced and do not look like it. We try not to get to carried away with really wild wood patterns primarily because the design makes a statement and the wood is there to back up the design, not dominate it. I think burled woods can work well with this design as long as we are careful not to over due a good thing. We had an architect come to us a few years ago with an idea and this is what the idea ended up looking like. I have to admit we were skeptical at first and were not quite sure how the heck we would construct the beds, we figured it out and ended up building four of them. It took a lot of laminating to build these posts. The hard part was keeping them straight! 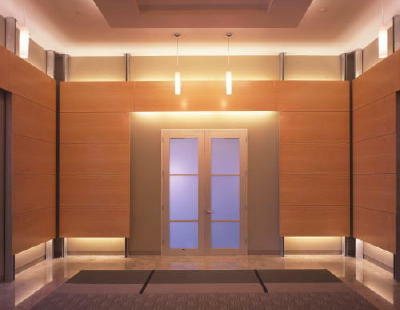 A few years ago, we provided a condominium complex in Florida with panels, columns, pilasters, fixtures, wainscot and trim. 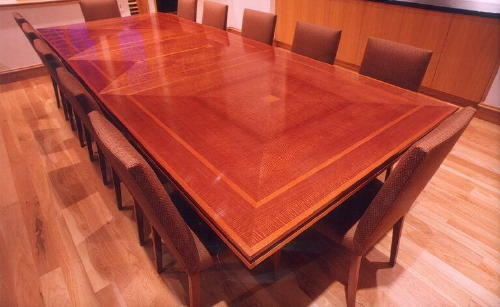 Accept for the media area, which is pommele Bubinga, most of the project is plain sliced South American Mahogany. We built everything here in Idaho, packed up a semi trailer, and shipped it all to West Palm Beach, Florida. Due to the heads-up thinking of the two designer partners involved in the project, everything survived hurricane Charley by sitting it out in a warehouse well inland of the beach property the complex sits on. Eventually, the mess was cleaned up and the project was finished. This is what it looks like today. 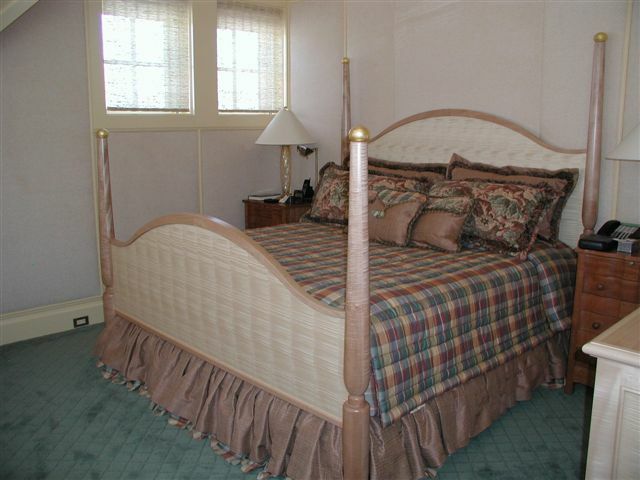 This entire master suite, which includes the bedroom, closet and bath, built in cabinetry and furnishings, for the most part, are finished with quarter figured European Sycamore, figured North American Maple, Birds Eye Maple and Maple Burl. If you will notice, the quarter cut Sycamore is slip matched to avoid barber poleing. Barber pole is when veneer leaves are dark then light then dark again and so on and so on. One reason this happens is that, when veneer gets sliced, one side of the blade opens the grain more and the other side of the blade closes the grain more. When you combine that with the grain appearance you are after, such as quarter cut versus flat cut, and the species you are cutting, you can easily have shade problems. Slip matching quarter figured veneer can work really well if the figure is running very parallel to the grain of the wood. It can be a lot easier to slip match flat cut. In this case we supplied our customer with center balanced and sequenced pommele Makore panels for their game room project. 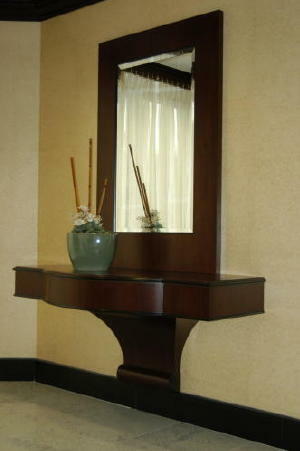 The style and rail work was fabricated with South American Mahogany for contrast. 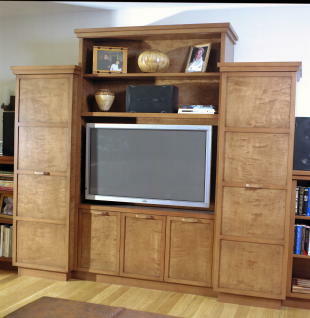 This media center is one of several we have manufactured over the years. We have also supplied many cabinet shops with the necessary component parts for their own Media/Entertainment Center projects. Our customer wanted this cabinet to be a free standing piece of furniture and be able to be moved easily if necessary. To accomplish this task we took the design she furnished us with and constucted the cabinet as three separate components that would integrate and function as a single piece. It was fitted with a component rack system, a cooling system and a hidden chase system. The chase system allowed necessary cables that link the media equipment together to travel freely from one section to the next and remain inconspicuous. This cabinet has since been relocated to a new home in another state. This cabinet is one of a pair that we built for a customer to be used as end tables for a sofa. They actually were part of several piece set that were different combinations of European Beech and African plain and fiddleback Sapele. 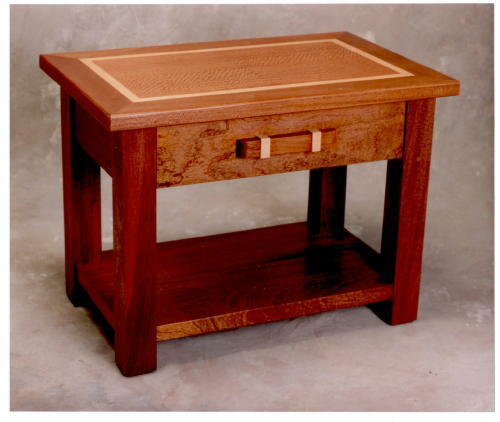 The top of this table has a field of fiddleback Sapele veneer with a European steamed Beech veneer inlay separating it from the solid plain Sapele border. 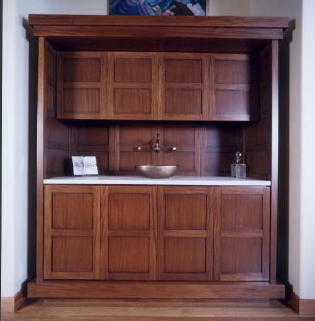 The body of the cabinet is constructed with solid Sapele.